A screenshot of Ferrox in action. Ferrox was a free and open source software application for the servers of web-based art and other multimedia archives. It was being developed by Fur Affinity to replace their current software. In June, 2006 the site announced an impending upgrade to the site called Project Ferrox; Fur Affinity opting to eschew the version numbers (i.e. v1, v2 and v3) it had previously used. Status announcements were regular during the following month, with Dragoneer announcing that a closed beta would begin soon and Alkora posting (now removed) screenshots of Ferrox to his Fur Affinity gallery. The code reached an estimated 60% completion before being pushed back to an early Winter/Spring 2007 release in effort to follow new quality and coding standards. The effective release date was "when it's ready" as Ferrox was not going to be released until Fur Affinity staff felt it had undergone sufficient testing and bug hunting. As months passed with no announcements, Ferrox was derided as vaporware. A request for coders was posted to the Furaffinity forums on September 2007. Although not officially stated, Ferrox's code would be starting from scratch. Dragoneer has stated that this would be the third incarnation of Ferrox. The project was initially headed by Crypto with six other coders. Due to other projects and scheduling conflicts, the development team was eventually reduced to Eevee and Net-cat. Eevee intended to release Ferrox as open source at some point and, in October 2008, Ferrox's code was made publicly available; however, few contributions have been made to project from outside the development team. Due to disagreements with Fur Affinity's policies, Eevee resigned from the Ferrox project on March 17, 2009. After the December 2009 Fur Affinity outage, downloading of Ferrox code is currently broken. Unofficial mirrors are avaliable on GitHub. ↑ Ferrox - any time now? ↑ Dragoneer. The Dragoneer Interview, Furry 101, March 13, 2009, accessed March 17, 2009. ↑ Eevee. 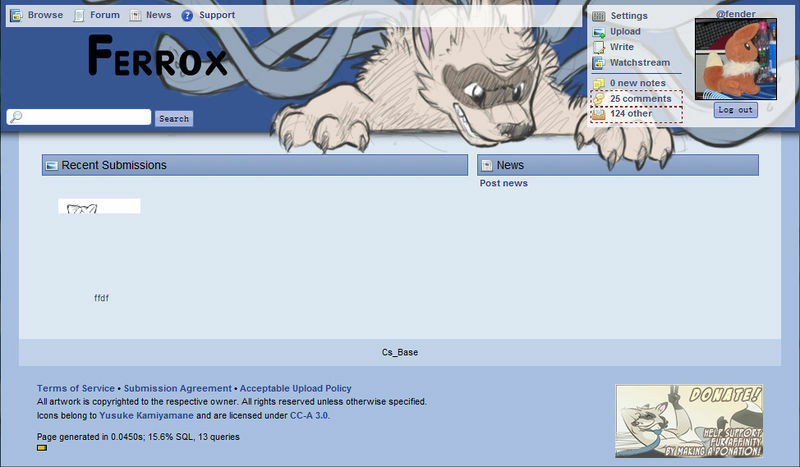 Ferrox: comments, management, openness, anthrocon, 0.0.1, us, Fur Affinity journal, April 28, 2008, accessed March 17, 2009. ↑ Eevee. On Ferrox, March 5, 2009, accessed March 17, 2009. ↑ RossyFox. Breaking News: Eevee Resigns from Ferrox Project, Fur Affinity Forums, March 17, 2009, accessed March 17, 2009. ↑ Eevee resigns, Ferrox Twitter, March 17, 2009, accessed March 17, 2009. ↑ Code freeze on current Ferrox codebase. - Fur Affinity Forums (August 26th, 2009). Retrieved on December 16th, 2009. Some of this page is derived or split from another article on WikiFur. The original article was at Fur Affinity. The list of authors can be seen in the page history. Unless otherwise stated, the text of WikiFur is available under both the GNU Free Documentation License and the Creative Commons Attribution-ShareAlike 3.0 license (CC-BY-SA).